Ben Carson is a highly regarded neurosurgeon who rose to national attention in 2013 when he spoke at the National Prayer Breakfast. He was extremely critical of Obamacare during his remarks, given with President Barack Obama in attendance. Shortly thereafter he began speaking in public on political and policy issues, typically expressing conservative views, and began to get attention as a potential candidate for the 2016 Republican nomination. He announced his campaign for the presidency in May 2015. Despite being a relative newcomer to politics, Carson is no stranger to attention. His life story, which includes coming from an impoverished background to become a world-renowned neurosurgeon, was made into a movie released in 2009 staring Oscar-winner Cuba Gooding Jr. as Carson. Most of Carson’s views line up with general conservative thought. He staunchly opposed Obamacare, favors tax cuts as a way to stimulate the economy, and believes the welfare system has caused people to become trapped in poverty. On national security policy he has generally favored a strong military and has been critical of the Obama administration’s approach toward problems in the Middle East. He also suggested that failure to appropriately regulate the financial industry contributed to the economic crisis of 2008 and that high tariffs on imports would be good policy. Carson’s position in the race has been fluid, drawing early interest and support when he first announced before fading early in the summer of 2015. He then rose into the top tier following several well-received debate performances in the late summer and early fall, but he has seen his support decline since mid-November following news reports and comments by the candidate suggesting he didn’t have a firm grasp on foreign policy issues. His fundraising, previously strong and leading the field, began to taper off at the same time. Although he has raised more than all of his GOP rivals at this point, he has also spent heavily, and it is unclear if he has enough funds to mount a viable campaign going forward. Carson finished in fourth place in the Iowa caucuses, a distant eighth in the New Hampshire primary, last in South Carolina, and a distant fourth place in Nevada, all of which reinforces his status as a long shot for the Republican nomination. He has struggled in recent months to demonstrate that he is capable of going from the operating room to the Oval Office with no stop in between. His relative inexperience on the campaign trail has led to gaffes and blunders that more seasoned candidates would have avoided. But his accomplishments both professionally and politically have impressed many voters, and in a cycle when a history in elected office is seen by many to be a liability, he could climb back into contention if several of his rivals were to seriously stumble and he were able to reignite his earlier fundraising success. 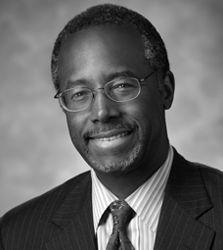 Benjamin Solomon “Ben” Carson Sr. was born on Sept. 18, 1951, in Detroit, Mich. He is the second child of Sonya Copeland Carson and Robert Solomon Carson, a Seventh-day Adventist minister. Carson’s parents divorced when he was 8 years old, after which his mother raised his brother, Curtis, and him as a working single mother. Carson graduated from Southwestern High School in Detroit before attending Yale University, where he received his bachelor’s degree in psychology. From there, he received his M.D. from the University of Michigan Medical School. Carson joined the prestigious Johns Hopkins Hospital in Baltimore, where he was professor of neurosurgery, oncology, plastic surgery, and pediatrics. He was named director of pediatric neurosurgery at the age of 33, becoming the youngest ever director of a major division in Johns Hopkins history. Carson’s work at Johns Hopkins focused on traumatic brain injuries, brain and spinal cord tumors, neurological and congenital disorders, epilepsy, and other neurological conditions. Carson made history in 1987 when he became the first surgeon to successfully separate conjoined twins. The Binder twins were craniopagus twins, joined at the back of the head. Carson led a surgical team of 70 members over 22 hours, successfully separating the twins. Both survived the procedure. Carson also played a significant role in the revival of a procedure known as hemispherectomy. He was able to refine the drastic procedure, where part or all of one hemisphere of child’s brain is removed to control severe pediatric epilepsy. He went on to perform the procedure many times. He announced his retirement as a surgeon in March 2013. A bestselling author, Carson has penned six books, including an autobiography, Gifted Hands. His autobiography was adapted into a TV movie for the TNT network in 2009, with Carson being portrayed by Oscar-award winning actor Cuba Gooding Jr.
Carson emerged on the political stage in 2013, in a speech given at the National Prayer Breakfast, where Carson opined on several social and economic issues confronting the nation. He criticized the Patient Protection and Affordable Care Act, also known as Obamacare, notably doing so in the presence of Obama. Since entering political life, Carson has been a commentator for Fox News Channel, and a weekly columnist at The Washington Times. Carson has been honored for his achievements numerous times throughout his life. In 2008, Carson was awarded the Presidential Medal of Freedom, the nation’s highest civilian honor, by President George W. Bush. He has been presented with 38 honorary degrees and dozens of national merit citations. A 2014 Gallup poll listed him as the sixth most admired man in the world. He has also been honored for his work with the foundation he co-founded with his wife in 1994, the Carson Scholars Fund. The fund provides scholarships for students in grades 4-11 for “academic excellence and humanitarian qualities.” Since its founding, the fund has awarded more than 5,700 scholarships. Carson met his wife, Lacena “Candy” Rustin, as a student at Yale in 1971. They were wed in 1975 and have three sons: Ben Jr., Rhoeyce, and Murray. Carson admitted to plagiarizing, and getting caught doing so, in a college paper. This is probably of little interest except that in his recent book, America the Beautiful, Carson appears to have also plagiarized part of the book, or at least was very sloppy regarding his citations. Carson has apologized and blamed it on citation errors – he did cite the borrowed text in the book’s endnotes, but did not indicate he had used substantially identical text. He has described himself as a former “flaming liberal” who turned conservative after seeing many of his patients in Baltimore who were dependent on government and listening to Ronald Reagan speak.9 As Carson has never held political office, he has no established voting or governance record, but there is no evidence his views and positions are not deeply and sincerely held, and his willingness to stand up to Obama at the National Prayer Breakfast suggests he is likely to remain firm in his principles. He notably spoke at the 2013 National Prayer Breakfast, touching on several social and economic issues facing America, all in the presence of Obama, whom he criticized.16 He has been a commentator of Fox News Channel17, a columnist at The Washington Times,18 and has authored six books. Carson has advocated for simplifying the IRS tax code with a flat tax and eliminating tax loopholes.22 He proposed a tax rate of 14.9 percent that would eliminate all deductions, including those for charitable giving and the home mortgage deduction.23 While he refers to this as a flat tax, the 14.9 percent rate would only apply to income beginning at 150 percent of the federal poverty level, and he proposes that those under that level would pay a “de minimis” tax of $100 on their income.24 Taxes on capital gains, dividends, and interest income would be eliminated entirely. Carson has since released an outline of a health care reform proposal centered on what he calls Health Empowerment Accounts, similar to Health Savings Accounts. Very few details were provided however, other than that funds in the accounts could be transferred among family members.48 It is unclear whether the government would fund the accounts, whether they would be mandatory, and whether the high-deductible plans they would be paired with would be the only type of insurance available. Carson wants the U.S. to lend more support to Ukraine in their struggle against Russian-backed separatists and to press European countries to look for and develop alternatives to Russian-supplied energy. He called for reinforcing American commitments to NATO. Carson has said he would give the Department of Education the authority to deny federal funds to colleges that exhibit “extreme political bias,”104 which could severely inhibit free speech on college campuses. Carson has also made several controversial remarks recently, including references to both slavery and Nazi Germany. In context, his comments weren’t especially controversial, but a skilled and experienced politician would know to avoid such language, and it suggests Carson may commit gaffes in debates or interviews that could overshadow his message. This concern was reinforced by his more recent statement that being a Muslim was inconsistent with being president of the United States.